The 1st of Elul is the New Year for the tithing of cattle. The tithe for cattle had to be made from cattle born in the same fiscal year, between 1st of Elul one year to the next. It is, more importantly, the month of preparation for the High Holy Days. It is said that during this month HaShem leaves His Holy Place to walk among us looking for souls to forgive and restore. Elul is therefore the month of teshuvah or repentance. It is a time for intensive introspection. During Elul we are encouraged to clarify our goals and plans for the upcoming year and beyond. More importantly however, this is the time for renewed spiritual communion and of coming closer to G-d. It is a time for realizing ones purpose in life. During Elul ones attention leaves sense gratification and turns to spiritual pursuits. We are aware that we will soon stand before the Judge of all judges and we prepare our cases by seeking to right all uncorrected wrongs. Our sages explain that the four Hebrew letters of the word Elul (aleph-lamed-vav-lamed) are the first letters of the four words אֲנִ֤י לְדוֹדִי֙ וְדוֹדִ֣י לִ֔י הָרֹעֶ֖ה בַּשׁוֹשַׁנִּֽים׃ (ס) — I am my beloved’s And my beloved is mine (Song of Songs 6:3). During the month of Elul HaShem abides with His people in special intimacy. This is a serious time, and is not to be taken lightly. Our introspection begins on the first day the Hebrew month of Elul. As with all Jewish holidays, the date of Elul changes each year on the Western calendars. Google "Elul [present year] for the date on your calendar. During the month of Elul we take stock of ourselves spiritually and socially. Have we offended anyone? If so, we should make every reasonable effort at making amends. We should sincerely ask for forgiveness, not just mutter the words due to our Elul traditions. Has anyone offended us? If so we should freely grant our forgiveness, while considering our part in the situation and seeking forgiveness for our involvement (whether the other party seeks our forgiveness or not). Of course we should do this everyday, but especially during Elul we consider where we may have been lax in this. Our preparations before the High Holy Days empowers us to observe the various traditions with a clear mind. When our consciousness is clear of negativity we are elevated and empowered to receive forgiveness and reconciliation from HaShem. The Holy Zohar explains that at the beginning of Elul we are achor el achor, "back to back" with G-d. In other words, as we begin the month of repentence our "backs" are turned away from HaShem. As result of our free will His is turn to us. But by the end of Elul we become panim el panim, we are "face to face" with the Holy One due to our teshuva (repentence). Our enhanced awareness of both our relationship with HaShem and with others makes Elul a very special time. As His Voice penetrates our consciousnes we ponder: Is there anything negative between me and the Eternal One? Between me and my family members? My friends? My neighbors? Am I doing everything I can to help in the work of Tikkun Olam (i.e. repairing this broken world)? Am I actively blessing others? Blessing Israel? Blessing the country in which I dwell to stand with Israel and for righteousness? What am I doing to bless and repair my world (tikun olam)? What am I doing with hte precious time HaShem is affording me? We begin with our own people. Are there divisions between me and my fellow Jew? Do I feel part of our people or do i feel separated from them? Do I embrace all Jews as family or do I view those of other Movements and opinons as outsiders? Do I act judgementally or with love towards my fellow Jews? Rav Kook, the first modern Chief Rabbi of Jerusalem stated that "As there are enough people practicing rejection, I choose to be one who embraces." Ask yourself, "Do I embrace my fellow Jews, giving them the benefit of the doubt?? Elul is the time to get back on the derech (the Path of G-d). It is the season of seeking and freely granting forgiveness. 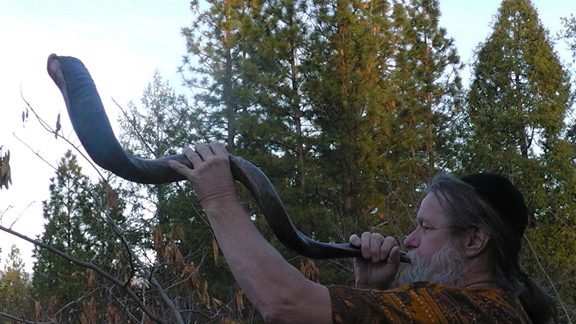 Beginning on the first day of Elul we start sounding the shofar (a specially prepared ram's horn; many Jews use other kosher horns from halachically permissible animals as you see me using in the photo below) every morning. Immediately after Shacharit (i.e. our morning prayers) we sound the shofar. Of course, one should never sound the shofar on Shabbat nor on the last day Elul. The shofar reminds us of many things. Rambam says it is the call to our souls. The sounding is an alarm to awaken us from slumber and to prepare us to meet our Maker. The shofar blast reminds us of Isaac's willingness to be sacrificed by his father, of Avraham's obediant willingness to sacrifice his son, and of HaShem's mercy through the sacrificial ram He provided instead. And so we ponder: would I be willing to sacrifice myself for the sake of others? For the sake of Israel? For the sake HaShem? The sound of the shofar recalls the bellowing trumpets of thunder as HaShem revealed His Glory at Mount Sinai to all of our people. Our sages say that every Jew, past, present, and future, including all converts, heard that shofar blast and are required to hear it annually on Rosh Hashanna. The shofar connects our souls together as the "servant" of HaShem and elevates our cries and teshuva to the King who is among us during this holy season. The sound/vibration of the Shofar reaches into colloective and individual souls in innumerable ways. Many Jews sound the shofar every day during Elul, and then during the shofar services the ba'al tekiah (of 'master of the sounding') blows three distinct notes in different combinations as called out by the service leader. At the end of the shofar service, a very long tekiah, the tekiah gedolah is sounded. When it is time to sound the shofar, the whole congregation stands, eager to listen and to join their consciousness with the holy cries. First we recite the blessing for the mitzvah of hearing the shofar. Note that the mitzvah is not for sounding the blasts, but for hearing them. Of course, the ba'al tekiah recieves blessings for enabling the hearers to hear even as he hears the sound himself. Tradition holds that shevarim is the melancholy broken heart crying out to HaShem, and that teruah is the sound of the soul weeping before the Creator. As you hear or sound the shofar allow your sorrow to wash over and through you. The Shofar is not a joyous sound. It is the cry of the repentant heart. Experience the sorrow of our people and allow the sound of the shofar to wash over you and to cleanse your soul. Hearing this cry is healing. Who makes us holy through His mitzvot and Who instructs us to hear the sound of the shofar. shehecheyanu vikeemanu v'heegeanu lozzmon hazeh. for giving us life, for sustaining us, and for enabling us to reach this season. Tekiah: This is a single, solid blast lasting between five and ten seconds. Shevarim: This is a broken blast of three bleeps. It should last about the same duration as a single tekiah. Teruah: This is the alarm cry. It consists of nine rapid-fire bleeps, again lasting about one tekiah. Tekiah gedolah: This blast is maintained for as long as the ba'al tekiah is able. It is cry of the hearers extending upward to the Throne of HaShem, may He be merciful and receive our heartfelt teshuvah (repentance). וְנַקֵּה / venakeh — and pardoning. Following the incident with the Golden Calf, Moshe Rabbeinu asked HaShem to explain His system for redeeming the world. HaShem's answer is known as the "13 Attributes of Mercy." This section of the Torah forms the essence of the "selichot " prayers. Traditionally the Selichot are recited before Shacharit (i.e. the morning prayers) so we wake up a bit earlier during these days. It is preferable that they be recited with a minyan (i.e. 10 Jewish males according to Orthodox halacha), however they can be recited, in a slightly abbreviated form, without a minyan. Check your favorite siddur for details on this. The heart and soul of Elul is teshuvah (repentance), which includes our rectification. In order to have clear communion with HaShem it is vital that we have a clear consciousness devoid of hate, resentment, and fear. Teshuva is vital for this. During Elul we seek to re-establish peace with everyone in our social circle and beyond. We ask for their forgiveness, we perform deeds of restitution as needed, we perform good deeds for no reason at all, and we spend extra time with HaShem through secluded personal prayer (known as hitbodedut). During this period before the High Holy Days we seek to enhance our religious experiences and practices and to attach ourselves ever more securely to HaShem as we seek His Mercy. So "L'shanah tovah tikatev v'taihatem!" "May you be inscribed and sealed [in the Book of Life] for a good year!"